A town of located on the banks of the river Ravi and one of the most sacred places of pilgrimage for practicing Sikhs. 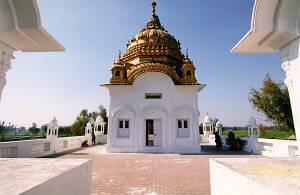 The Dera Baba Nanak was settled originally by Guru Nanak Dev in one of the adjoining villages. He is the first of the 11 Sikhs and the founder of the Sikh religion. The town then grew up around the settlements and teachings of Nanak Dev, many of the temples and building are from the time when he lived here, which was around 1515. At this time he returned here to visit his family, who still have ancestors in the city.